NOT recommended for : Those who are used to really fast paced songs. 17 months of the tragedy that took the lives of their beautiful members EunB and Rise, the remaining members of Ladies’ Code are back with their new album titled ‘Myst3ry’. Their first album as a trio, the tracks were produced by the Mono Tree team that also produced songs like Stellar’s Vibrato. Let us look at what they have in store for us! A wonderful song to start of the album with, My Flower is a ballad with beautiful vocals and instrumentals. A hauntingly eerie yet chill song, it gives off an ethereal-like feeling when listening to it. My personal favourite in the album, it is a perfect song to listen to especially during a cold rainy night. The lyrics in the song somehow gives me the illusion of EunB and Rise singing the song to them, turning the whole song into an emotional experience. The title track of the album, Galaxy is another chill song from the album. A song that is honestly stuck in my head right now as I’m writing, Sojung’s vocals at the start of the chorus was mesmerizing. The instrumentals and lyrics gives off a celestial-like experience, making you feel like floating in space. Chaconne is a really unique song. The violin in the beginning threw me off. The rest of the song contained instrumentals that are usually not found in the K-pop world. However, with the combination of their vocals, the song in my opinion is a masterpiece. The guitar and violin combination along with their vocals in the chorus was just perfect. A wonderful way to end of the album. The whole album was of a different music style compared to their previous albums. None of it had elements like their previous songs “Pretty Pretty” or “Kiss Kiss”. In fact, it has a very heavenly and emotional feel throughout which I actually really like. I personally wanted more than 3 songs but I’m pretty satisfied anyway. I’m glad the girls are back in the music scene and I hope to hear from them soon again in the near future! 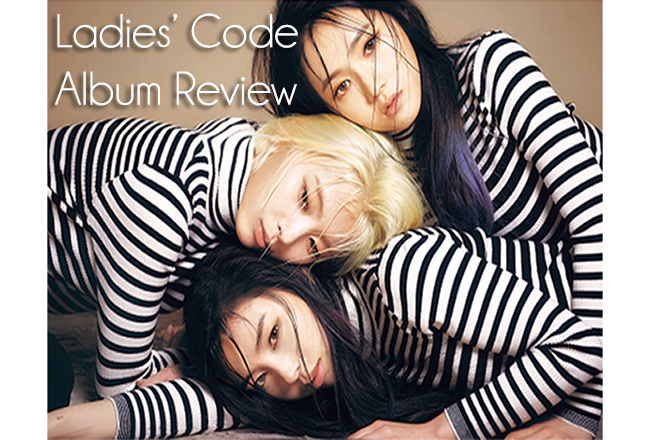 It’s a new and experimental style that Ladies’ Code adopted, which worked really well.